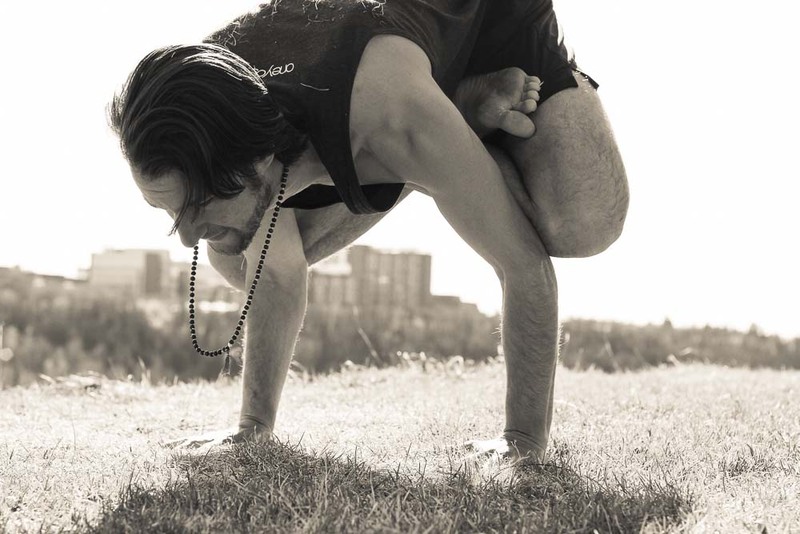 Zoran's drishti aids in his balance and concentration. Drishti, or focused gaze, is a means for developing concentrated intention. It relates to the fifth limb of yoga concerning sense withdrawal, as well as the sixth limb dharana relating to concentration. There are a total of 9 drishtis and each yoga asana is associated with one. There are many yoga systems that use this practice and differences regarding which are used for specific asanas, but drishti is mainly part of the Ashtanga Yoga, Hatha Yoga, Bhakti Yoga and Raja Yoga traditions. Why do we practice drishti? Focusing your gaze as specific points allows your concentration and intention to flow in a circular manner. The gaze first comes from within and is then directed outward to a specific point. This intense focus creates an energy that is reflected back into your body to hold your concentration. This allows the 'looking' to reflect inward, creating a withdrawal of the outward senses and a connection to Self. The directed gaze also gives the mind a focused visual stimulus; wherever your eyes go your mind will follow. Drishti allows the mind to be singularly focussed and balances our internal and external practice. In a visually addictive world, our attention is like currency. Spend it wisely! Though the gaze is fixed on an external point, the true meaning of drishti is meant to direct our focus to the subtle aspects of our practice. We may become more aware of our breath, mind, and internal workings of our body simply by creating this circular focus. In general, let your gaze move in the direction of your stretch. Prana follows the direction of your gaze. In Urdhva Mukha Svanasana (Upward-Facing Dog Pose), for instance, we gaze at the nose tip: Nasagrai Drishti. In meditation and in Matsyasana (Fish Pose), we gaze toward the Ajna Chakra, the third eye: Naitrayohmadya (also called Broomadhya) Drishti. In Adho Mukha Svanasana (Downward-Facing Dog Pose), we use Nabi Chakra Drishti, gazing at the navel. We use Hastagrai Drishti, gazing at the hand, in Trikonasana (Triangle Pose). In most seated forward bends, we gaze at the big toes: Pahayoragrai Drishti. When we twist to the left or right in seated spinal twists, we gaze as far as we can in the direction of the twist, using Parsva Drishti. In Urdhva Hastasana, the first movement of the Sun Salutation, we gaze up at the thumbs, using Angusta Ma Dyai Drishti. In Virabhadrasana I (Warrior Pose I), we use Urdhva Drishti, gazing up to infinity. In every asana, the prescribed drishti assists concentration, aids movement, and helps orient the pranic (energetic) body. In some cases, an improper drishti can actually be harmful, like shoulderstand where the head should not turn to look left or right. Keep this in mind when working with drishti in your practice. Let the drishti be your guide in to the unseen, to your source, your truth. Allow the flow of your gaze bring you into your true balance and nature.